Alright you katana weirdos, here's one for you. 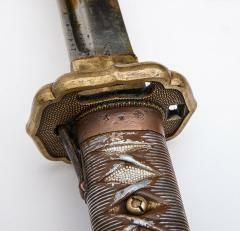 During World War 2, the time when swords were absolutely, hopelessly obsolete, the Japanese non-commissioned officers actually carried one to battle. This is a real deal relic from times past when everything was, uh, better off. 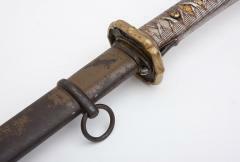 The mental image of a katana probably revolves around traditions, craftsmen and quality. Well, during the Second World War years things were different when the Japanese army needed to equip every NCO with a katana, because traditions. Not every family had these, so they mass produced such blades to fill the requirements. The end product does indeed look like a katana the army got their hands on - the handle is just painted steel and though there are some details too, they look a bit like movie props. The sheath is steel and painted camo green, because of course it is. It also has a hanger ring and the katana locks into it with a latch. 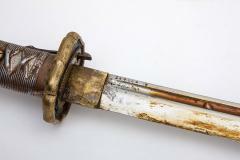 All in all, a "nice general purpose katana" - this is after all made for slicing up people, so it's a damn solid piece. Approval stamps "Army arsenal Tokyo factory" and "Tokyo First Army arsenal trademark 1940-1945"
Though on the outside this certainly has some patina, the blade itself is in excellent shape, hardly used at all. It was still covered in thick brownish grease (pictured) when we got it, but someone wiped it mostly off. This is an absolutely authentic piece. Warning! Before buying, please make sure that these are legal to import to your country! We take no responsibility if the customs officer confiscates your precious bayonet/knife/machete! These are perfectly legal in Finland and that is all we are interested in.